Origins – The Beauty Spot. I got some really good feedback from my Acne Journey post last week, so I thought I’d show you exactly what I’ve been using and doing in order to improve the state of my skin. 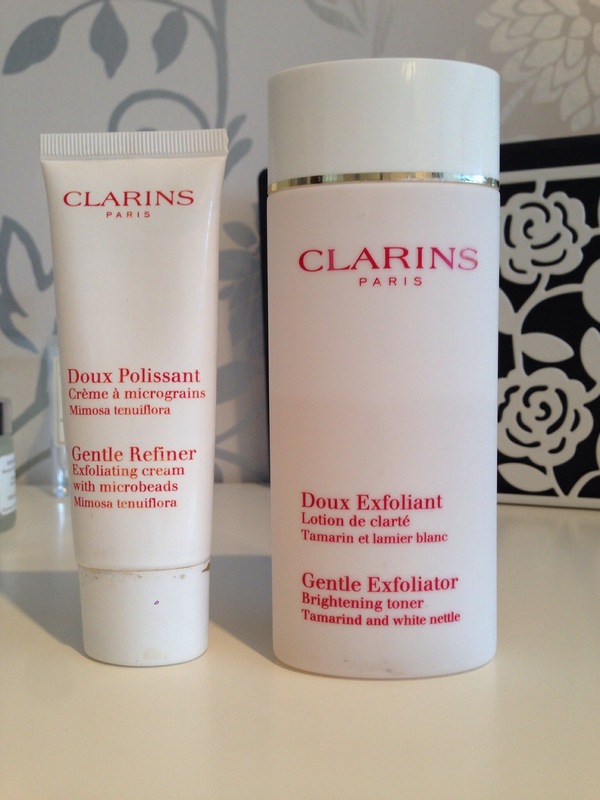 My favourite cleanser to remove makeup is Clarins Gentle Foaming Cleanser with cottonseed. I’ve used this for years and it just gets rid of everything!! I use this as a my main first cleanse to remove my makeup at night. It’s soft on my skin but just dissolves makeup so easily, I couldn’t be without! One of the main changes to my routine was using a cleansing balm. Both of the ones I’ve used are organic and just give me that extra deep clean feeling afterwards. 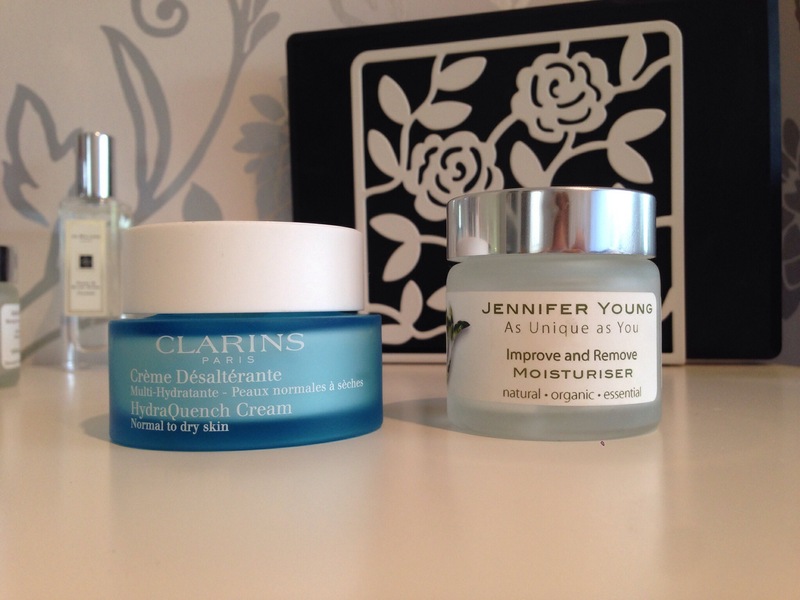 I’ve used the Jennifer Young Improve and Remove Cleansing Balm, and a DIY one. I’ve found that massaging these into dry skin after my first cleanse seems to work wonders. For one thing it relaxes me before going to bed, but my skin feels soothed and rejuvenated by just a 5 minute massage! I saw the DIY Cleansing Balm on Gemsmaquillage a while ago. Click the link to see how to make it. 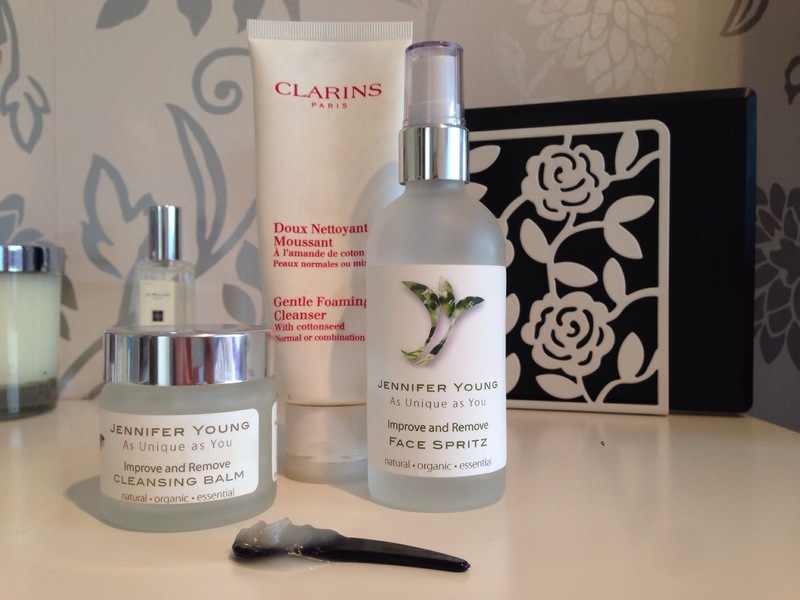 I’m not great with toner, but again I’ve been using the Jennifer Young Facial Spritz after my cleanse. It instantly refreshes my skin and preps it for whatever I use next. 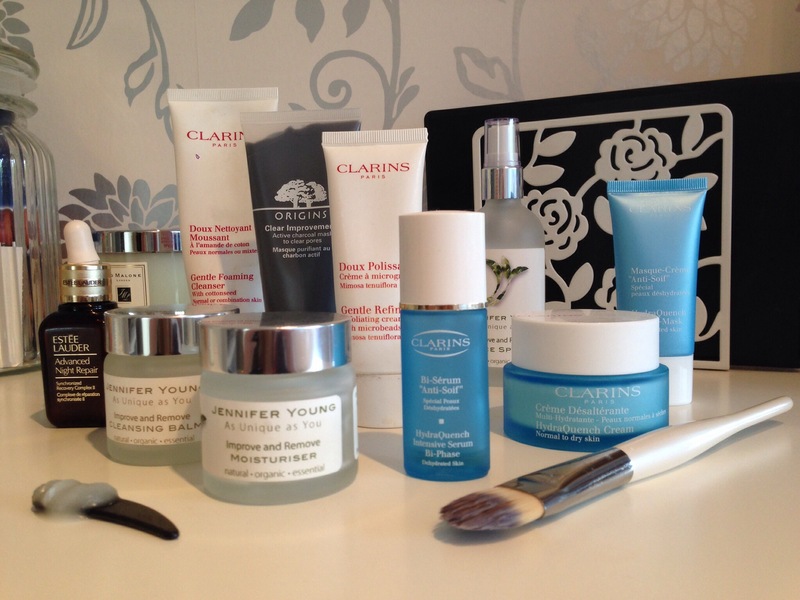 For the morning I like moisture, so I reach for the Clarins HydraQuench Bi Phase Serum. So light, but so powerful and effective for dehydrated skin! Although I have acne, my skin is definitely dry/dehydrated so getting water and moisture into my skin is a priority! 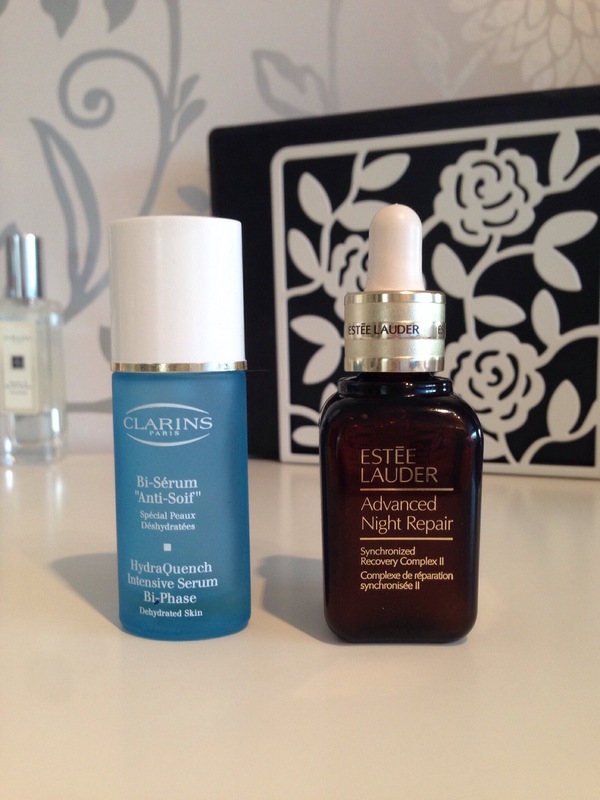 For evening, I’ve been loving the Estée Lauder Advanced Night Repair 2. A tiny drop of this and I’m warding off any early signs if ageing as well as intensively hydrating and repairing my skin! For morning, I follow my Clarins serum with the Clarins HydraQuench Cream. This range is all about boosting water levels, so even if your skin is oily, you can use this range. You just need the right texture. The cream is for a normal/dry skin. It sinks into my skin so quickly, and instantly feels comfortable and ready for primer or foundation. For night I’ve been using a slightly richer formula, the Jennifer Young Improve and Remove Moisuriser. This one can be used for daytime too, I just find it’s slightly too rich. However, it’s perfect for nighttime. It smells like a spa and just relaxes me before bed! I try not to over exfoliate my skin, but I’m aware that it improves the results of all other products you use so try to do it around twice per week (oily skin should only really need it once). I flit between a chemical exfoliant, Clarins Gentle Exfoliating Toner, and a manual scrub, Clarins Gentle Refiner. I sometimes even mix a little of both of these products at the same time, as they do a similar thing in their TriActive Facials. 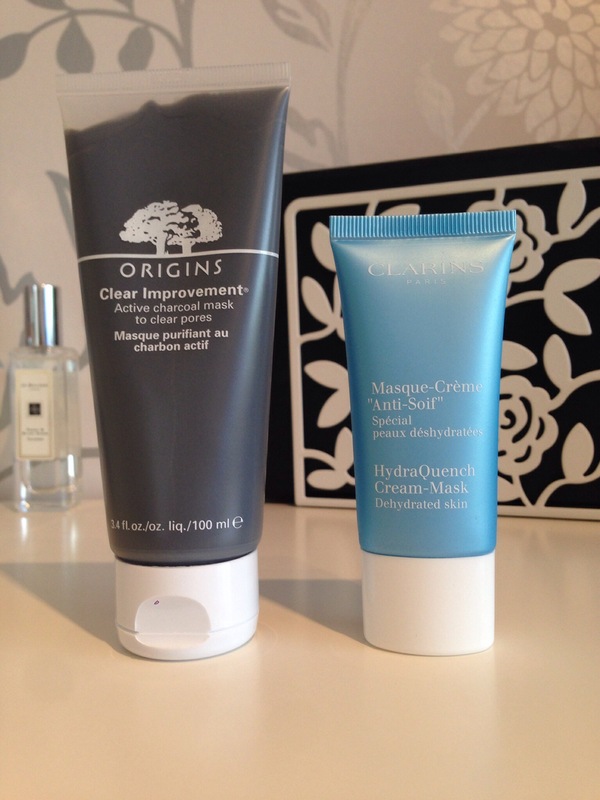 I have recently been using the Origins Clear Improvements Charcoal Clay Mask once per week. It literally feels like it’s drawing everything bad out of your skin. Although, I don’t really like how my skin feels after using it, so I whack on some Clarins (surprise surprise!) HydraQuench Cream Mask. This again just gets more moisture into my skin. Twice per week (usually at night) – Double cleanse, exfoliate, mask x2, eye cream, serum, moisturiser. I have also kept these products for a good few months. I’ve not been chopping and changing what I use, which I also think has helped. My skin is settled into this little routine and it seems happy with it, so I’ll be sticking with it for a while. The only thing I’d really like to try is the Alpha H Liquid Gold. Anyone tried it?